Are The Twin Towers Coming To Melbourne? 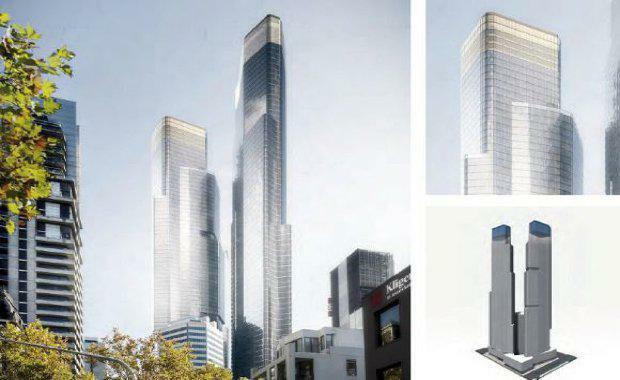 Twin high-rise residential towers topping 246m could be built in the centre of Melbourne under an ambitious new plan proposed by developer 3L Alliance. The $750 million project would be built on a 7,295sqm site at 350 Queen Street and would see a five-level podium topped with dual 79-level residential towers. The development application, which was lodged in April 2015, includes 1,925sqm of retail space, a 120-space child care facility, 554 car park spaces, 603 bicycle spaces (a 154 bay commercial car park would be included in the basement). Amenities would include pools/spas, gym, saunas, a home theatre, communal kitchens, yoga studio and karaoke area. The application is seeking approval for Stage 1, which would include 864 apartments, and Stage 2. Cox Architecture and Fender Katsalidis have been appointed joint project architects following a design competition.